Halloween is around the corner! You have a to-do list that includes buying treats and candies, costumes, pumpkin carving and maybe even a big party at home. You want to remember every detail and your dog is one of the first things on the list! Keep your dog inside your home, unless your neighborhood is quiet and you want to take your dog out for a walk. Sometimes children go running to pet a dog, and they don't ask if it's safe to do it. Your pet may be the friendliest pet in the world, but in different situations, he can be scared and bite someone! We don't want a scary Halloween. If you sIf you stay at home to greet children at the door with treats, put your dog in a separate and quiet area. If it's possible, take turns with the family so one person can stay and play with the dog. Noises and unknown smells coming from the door that can make your dog feel nervous. Make Halloween a happy day for your pet. Be careful if you have children. Explain to your kids that they can't give candies or chocolates to the dog and watch them anyway. Your dog may have "that begging face" that kids can’t resist. Instead, have a small batch of treats specially made for your furry friend! Does your dog have a tag or a microchip? Halloween is not as scary as fireworks for dogs, but if you get distracted and your dog is anxious, he could run away! If you wIf you want to make a costume for your dog, make sure you make it with a soft and comfortable fabric and nothing so complicated that he can't move. Do you want to take your dog to celebrate? Check with the pet shops in your area, some of them have dog parades and costume contests. Have a happy and safe Halloween! And don't forget to add these tips to your to-do list. Do you have another suggestion? Share it on the comments! You know the feeling when you are at work or traveling hundreds of miles away and you want to go back to your home where your furry friend is waiting for you… but you smile because you have the best pet sitter in the world. It is not easy to find someone who is kind and reliable and most important, who makes "click" with your dog(s). Celebrate your pet sitter and show your appreciation with this free "card-award". Click here to download the template, print, trim and write a personal note inside. If you have a super-special-awesome dog's best friend… congratulations! This is a great finding! A book from 1881, "The Illustrated Book of the Dog". If you love dogs and old books, you will enjoy this one. More than 700 pages of text and illustrations with the history and descriptions of many breeds, how to make a kennel, general management of dogs, grooming, feeding, medicine and much more. I haven't read the whole book, but browsing through the pages I found beautiful illustrations in color and black and white. I also love the old yellow tone of the paper. This book was scanned from the original. It is interesting to read about dog's life in 1881. The book is focused more on show dogs and what characteristics were important to the judges to consider in a competition. This is a sample of dog clothing. Another page with the description and history of a breed. A Scotch dog beautifully illustrated. And the Spaniels at an 1881 home. If you want to read the book, click here. The page gives you options to read online, download a pdf, read on your Kindle and some more. Do you often find yourself doodling on napkins or paper? I prefer paper and pencil, but I am always looking for new Apps. or other mediums that I can mix in my work or just for fun. In this post I want to share with you an App. that is great. 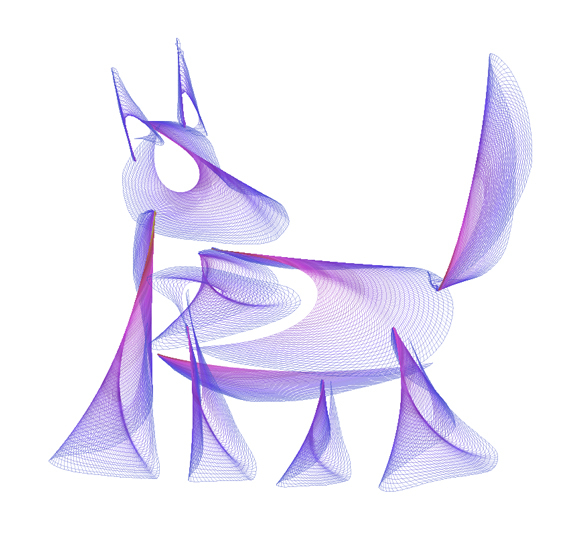 Not only you can doodle dogs but any abstract shape that you can imagine. The name of the App. 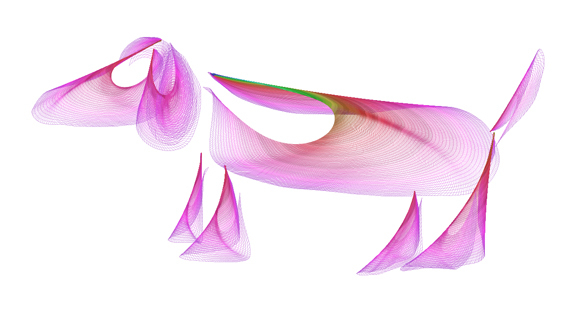 is Flowpaper and you can download it here. These are the doodles that I created in seconds. It is that fast. If you want to spend more time making combinations of colors and shapes, try it!